The University of Toledo will not be renewing its contract with Epsilen. The current contract will end on September 30, 2013. After the current contract expires, all Epsilen user accounts will remain available. You will still have access to existing courses, groups, matrices and other existing content. However, the university will no longer have global access to administer this content and only users who currently have access to the content will be able to access it moving forward. The university will not be able to create new courses or matrices. If you have any questions or comments, please contact Learning Ventures at utlv@utoledo.edu or 419-530-8835. UT Learning Ventures would like all faculty to know that Respondus has just scheduled a series of training sessions on Respondus Monitor. The goal is to provide instructors everything they need to get rolling with Respondus Monitor this Fall. Please invite any instructor who might have an interest in using Respondus Monitor in the near future, as well as instructional designers or support staff who want to learn the best rollout techniques. If you have any questions about Respondus Monitor, please feel free to contact UT Learning Ventures at utlv@utoledo.edu or 419-530-8835. Echo360 will be unavailable on August 6th starting at 10:00 p.m. The outage is necessary so that both the server hardware and software can be upgraded. During the outage, no Echo360 content will be accessible and no new captures can be submitted for processing. Service should be restored sometime during the morning of August 7th. Using the Blackboard Exemplary Course (ECP) Rubric as a guide, Blackboard’s Exemplary Course Cohort will provide theoretical concepts and practical tools for instructors to recognize, organize, and build online courses for both blended and online learners. Over the course of four weeks, ECP Directors and 2013 Exemplary Course Winners will expand upon each element of the rubric. This program is most beneficial to educators and designers who are new to online learning. The cohort will not have weekly assignments, and there is no cost to participate. Live sessions will be held each Monday at 11 AM EDT and will run from July 22 until August 12. All sessions will be recorded and posted online. 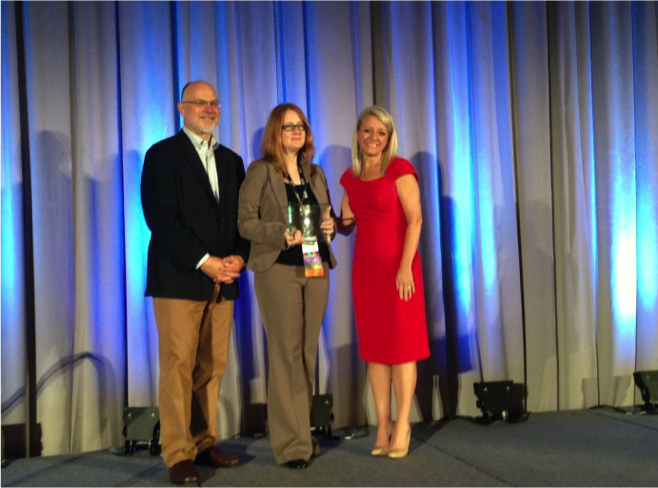 Phoebe Ballard, Learning Ventures’ Senior Instructional Designer has received this year’s Blackboard Catalyst Award for Exemplary Course Program and returned with the trophy from Blackboard World conference held in Las Vegas, Nevada last week. The online art course, ART 1070 – Fundamentals of Digital Media, designed by Seder Burns, associate lecturer of New Media, and Phoebe Ballard was also one of ten exemplary course winners recognized as a Directors’ Choice for Courses with Distinction. Photo: Left to Right: Ray Henderson, Phoebe Ballard, and Stacey Fontenot. Photo by Justin Ballard. Check out this video for more information about this exemplary online course and this link for more information about this award. If you are interested in the Blackboard Catalyst Award Program please contact our instructional designers. Teach Online? You Need This List of 17 Course Best Practices!